Ever felt annoyed hearing the person on the subway or at the table next to you say this into their cell phone? Ultimately, talking on cell phones in public places has become a shunned activity, but I’ve always wondered why this is so annoying to us? The first is that we can’t hear the whole conversation. 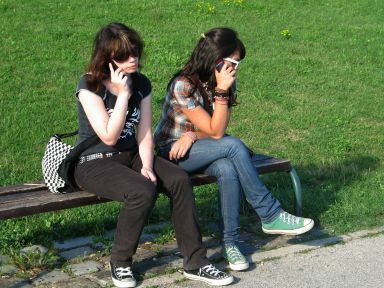 When people talk in public, we eavesdrop, even if not intentionally. We hear the statement and the response — all is well. When someone is talking into a cell phone, it creates a mental hole in the conversation. Mental holes are things that draw our attention and so even when we don’t want to, our brain continues to seek answers to questions that we will never be answered. This makes it very hard for us to ignore and pay attention to something else. Moreover, at random times, some person next to you starts saying something to no one in particular, drawing our attention only to see a blue light blinking from their ear. As one of my friends told me, it’s getting a lot harder to tell the mentally ill from the normal people in San Francisco, since someone talking agitatedly to themselves may just be talking into a bluetooth headset. The second is that it creates artificial entries into an environment that break the illusion of connectedness and solidarity that groups of people otherwise have. I think this is a minor effect compared to the first, and perhaps is related to it. We don’t feel like we belong in the conversation or are being excluded. It starts to break the group up and we don’t like this intrusion into our space. There are analogies to this in the business or relationship world. If our interactions with them feel as though we are talking to no one in particular or are posing questions by our actions that are never resolved, we not only don’t connect to our customers, we disenfranchise them. Perhaps there are other reasons why this is annoying, I’d be interested in your feedback. If you have ideas, leave a comment below. That is another good article. thanks for the reference Chad. Anything (ringtone or talking) that’s louder than the average conversation level in the area or group, gets noticed. People talk as loud as the handset sounds to them, and by covering their ear, they can’t blend that volume into the local level. Very good observation. We tend to mirror others volume and manner when we communicate with them, only in this case there is only one party, and each party is in a different social context.